Fenning's Bakeries were owned by Conrad and Marie Fenning (Pfenning). The first shop was opened in 1917 on the northwest corner of NE Killingworth Street and Borthwick Avenue. Conrad Pfenning was born November 6, 1891 in Norka, Russia, the son of Johannes Pfenning (born 1864) and Elisabeth Heinrich (born 1868). Conrad arrived in the United States in 1905 and his wife Marie Giess (born about 1896) arrived in 1912 according to the 1920 U.S. Census. At that time, Conrad and Marie (now the Fenning's) lived at 1210 Commercial Street. The Giess family owned a flour mill in Russia. The 1929 Portland City Directory lists three Fenning store locations: 803 Mississippi Avenue, 280 Russell and 1158 1/2 Union Avenue North. By 1930, the family had moved to 802 Michigan Avenue. The 1933 Portland City Directory lists Conrad as the foreman of the White Palace Delicatessens. Conrad was also an owner along other investors who did not participate in running the operation. Baked goods from Fenning's were sold at the delis. According to Conrad's grandson, Timothy Podhora: "The White Palace Deli's were ended because of the depression and WWII era price controls. My grandfather actually did great business with them feeding the shipyard workers -- but he couldn't turn a profit with price controls on prepared foods." Members of both the Pfenning and Giess families worked in the bakery and deli businesses. By WWII, the Fenning's had moved to 3243 NE 64th Avenue. The television series "Grimm" season 4 episode 13 - "Trial by Fire" was filmed in part at this house. A local newspaper reported in February 1961 that the Fenning's operated the oldest bakery in the city of Portland. At the time Conrad was working with his son, Wesley. The article also mentions Pete Walters, a fellow Volga German, who owned and operated Rotary Bread. Pete Walters was married to Elizabeth Yeager. Members of the Yeager family founded the Montavilla Bakery and the Beaverton Bakery. Newspaper clipping courtesy of Timothy Podhora. 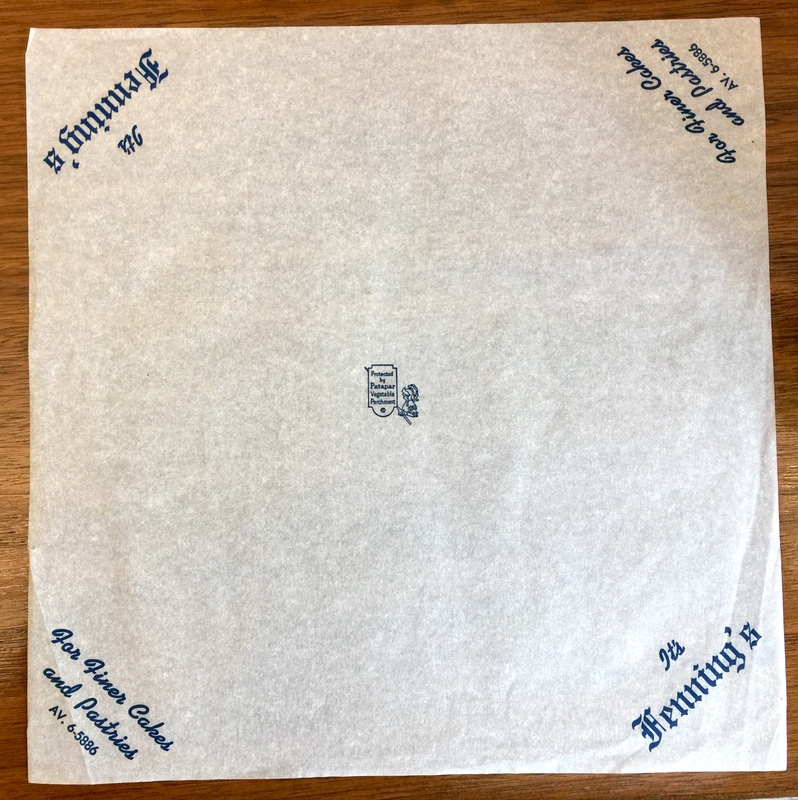 A sheet of bakers parchment paper from the Fenning Bakery. Courtesy of Timothy Podhora. Marie died in 1965 and Conrad died in Vancouver, Washington in September 1970. ​Conrad was the second cousin of Henry P. Fenning who owned Fenning's Market. 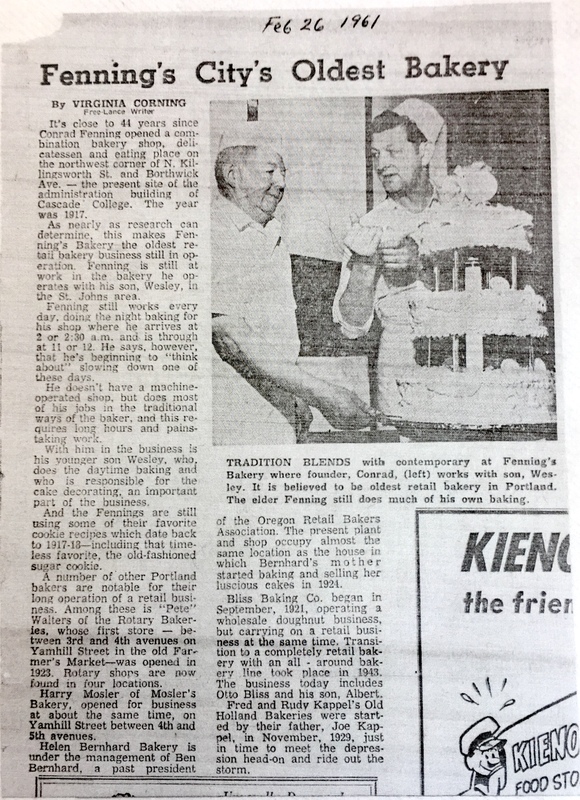 "Fenning's City's Oldest Bakery" The Oregonian, February 26, 1961. Portland City Directories, Draft Registration Cards and U.S. Census Lists - Ancestry.com. ​Timothy R. Podhora, grandson of Conrad and Marie Pfenning.